Well years pass and things change. My son was born and that eats into your time and I kind of forgot about it. But sometimes a thought bubbles to the surface from time to time. 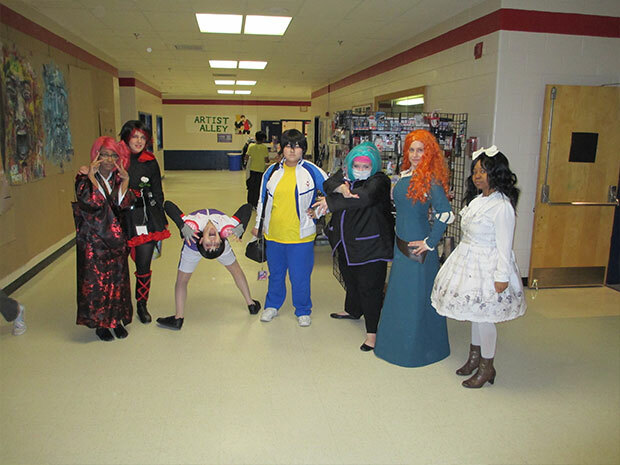 One day I thought “I wonder if those kids still put on an anime convention in that high school.” As it turned out, yes they did. To quote their website: “This club started 8 years ago with 8 like-minded kids crowded around a laptop in a deserted high school hallway. Today those kids are college students and that club is now 40 people gather around a projection screen.” That’s always an encouraging sign. To see more kids spread the word, to get more people interested in anime is a good idea. Little events like this can do more than any amount of streaming sites or small blurbs on geek culture websites. 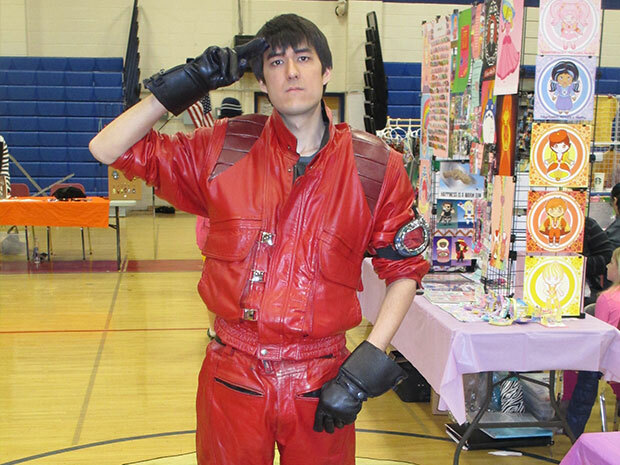 So on the 28th of March I packed a small bag and took my son to CHS Otakufest 2015. After a quick sign in I took a look at the general lay of the land. 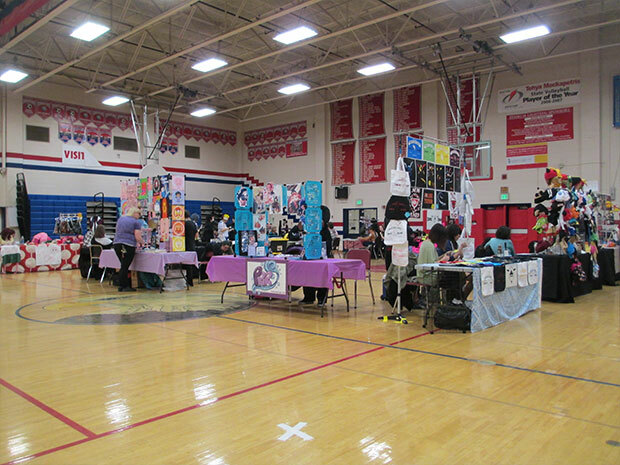 One lone dealer in the hallway, signs pointing to some viewing rooms, a panel room, the artist alley moved into the gym, auditorium for larger events, half of the cafeteria turned into concessions, the other half the game room, and a few other curious rooms I’ll touch on soon. I decided to take my son to the first event in the auditorium. 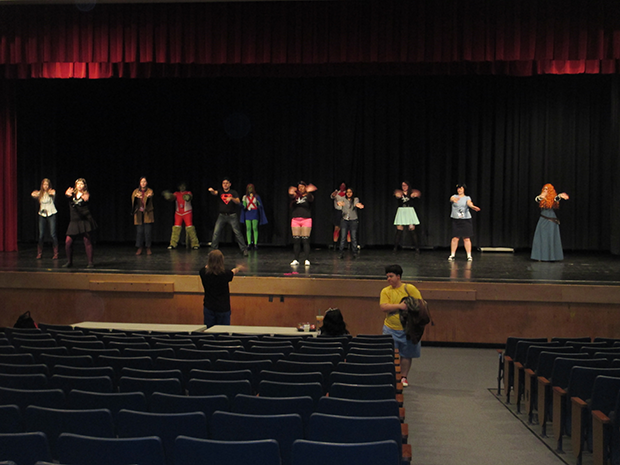 A dance group called Libra Edge put on a teaching show where you could learn J-Pop and K-Pop dances. They formed at Otakon in 2009 to teach these dancing workshops and singing techniques. They did a few demonstrations from songs like 123 by Morning Masume and Bad Girl by Lady’s Code. My son danced up a storm, of course not to the instructions but he had a good time. We left before the proper instruction took place, a three year old’s attention span is hard to keep at the best of times. We took a try in the game room before the tournaments started. Every tournament this year was a version of Smash Brothers. Melee, Brawl and WiiU each had a tournament. Projection TVs screened sweet Nintendo violence on the darkened walls of the cafeteria, while to the side there were a few other games, notably a Halo game that I didn’t quite recognize and a Naruto game I also was unfamiliar with. 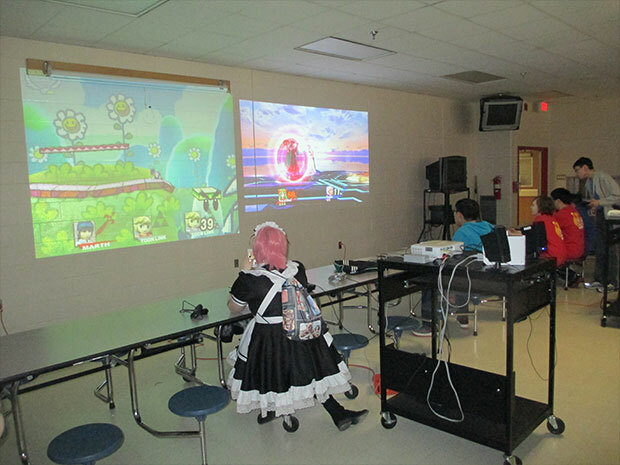 Still, they only used one of the projectors for tournaments so the other was always free to play some Smash Brothers Melee. My son and I played around a bit on that, but he can’t dashwave so he’s still a scrub. We strolled around the artist’s alley, mostly because the whole “my son being three” thing prevented me from any hard browsing at the lone retailer until my wife arrived. As expected many tables were taken by other high school students with some art for sale, and local producers as well. I got a fun hat for my son with Pikachu ears, as is custom at these events. I also enjoyed a few buttons featuring the Baltimore favorite mascots of the Utz Girl and Mr Boh in a kind of Adventure Time style from Grunge Muffin Designs, and a nice cast silver pendant depicting the Winchesters sweet ride on Supernatural by R.E.S designs. Both were very professional in their booth presentation and also love supporting these small events to really help out the fandom. One of the biggest surprises for me was the DJ booth in the artist’s alley. 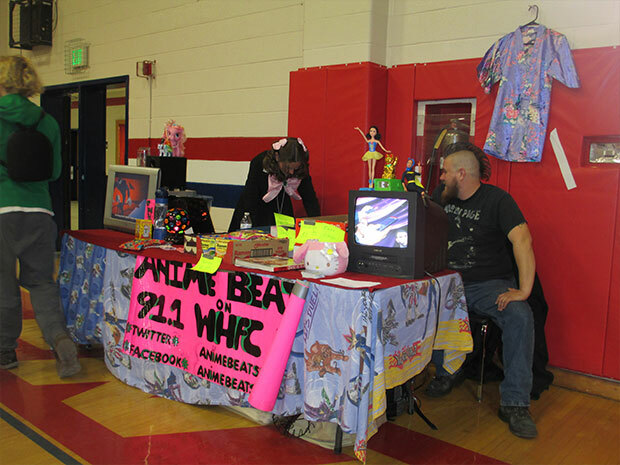 It was hosted by 91.1 WHFC Harford Community Radio, where Thursday nights at 10pm is dominated by Anime Beats, showcasing anime, J-Rock, J-Pop, K-Pop and video game tunes. The booth they put up was so great. They had two CRT televisions showing good old VHS 80s and 90s anime while they played lots of cool tunes. They also had a kind of DVD, manga and general used Japanese stuff rummage sale to support their studio. It was a hot mess of a booth and I loved every hastily drawn sharpie poster all over it. It was about this time I broke for lunch with my son and introduced him to Lotte products, learning he’s not a fan of snack cakes. But he was retrieved by my wife and I moved onto a panel hosted by The Manly Battleships, one of those small groups that do convention panel programming usually as a way to attend more anime conventions. They have a list of subjects for all age ranges and that’s something that most of the named panel groups don’t do. They tend to stick to one sort of panel and get known for it, these folks want to fill in those gaps in a schedule but oddly it’s hard to get programmers to warm up to the idea of flexibility. Mr. Panda and Rockstar have been doing panels for some time before forming together as TMB in 2013, and have done the east coast circuit from Connecticut to Florida since then. 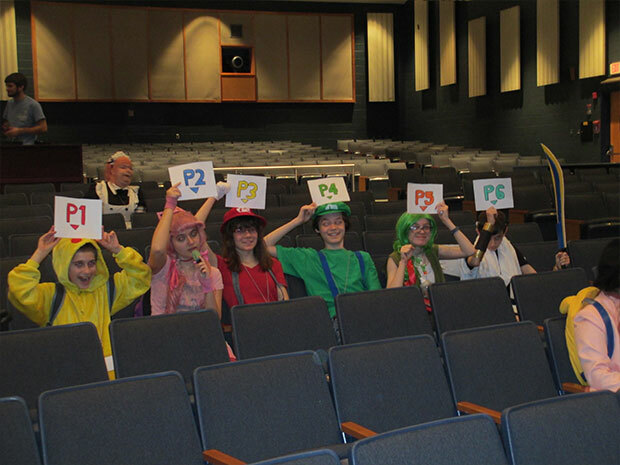 The panel I attended was a game show type called “Gameshow Impossibru: Retro Gaming Challenge”. 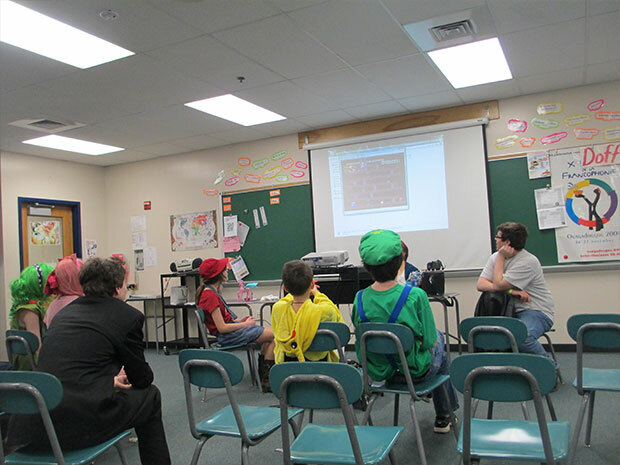 It was very interesting watching high school kids take on the hardest levels from Batman, Darkwing Duck, Contra and Ninja Gaiden. I was called up to participate and got stuck with a game I had never played before, Thunderbirds, based on the Gerry Anderson animation of the same name. It was one of the longer challenges but I did make it to the end of the stage, only to not know my boundaries and knocked myself out in the end. But between most of the room clearing out for one of the Smash Brothers tournament and the fact a lot of the gamers didn’t get as far as I did I found myself competing for the grand prize, a DVD, as is custom. We played the two player mode of Double Dragon and as most of the verses modes go in that game it’s a war of attrition rather than skill at times. I came in second… and won a can of Surge. I knew it had resurfaced, but I’ve never seen it in the wild. I plan on saving it until I need to feel like I’m sixteen again. There were a few other features. There was the standard manga reading room, which I heard have disappeared from some conventions entirely. There was a maid café but those have never been my scene, and let’s face it as I might have been the oldest participant there it would be high up on the creep meter to waltz in there with everyone being well out of my age range. One feature I thought was interesting was the “Adult Daycare”. No one under 21 admitted, it was a room set up for us old fogies to drink coffee and watch Indiana Jones movies while the kids went and did their weird poke-mans things. Certainly not what I expected, but seeing the glazed over fathers and mothers of conventions past I think every such event could use such a room. 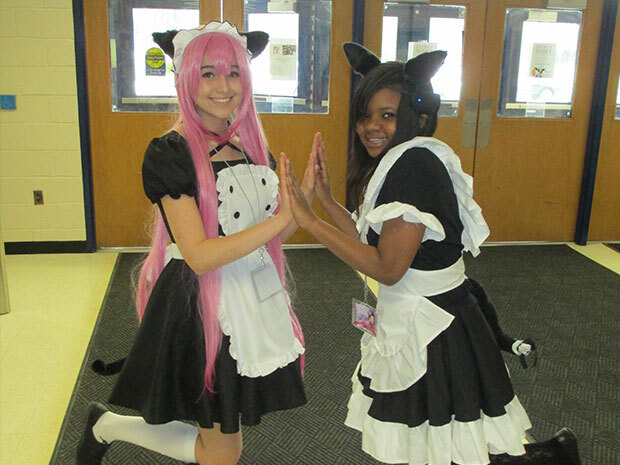 I can’t stress enough for everyone to seek out these small college and high school efforts when it comes to anime conventions. You never know what you will find and it’s a great way to show the newcomers to the hobby that it’s a hobby you can have for a long, long time.